Perhaps Sarah was the only one who knew how serious it was. She was an Inuk and a grandmother. She knew the ripple effect of youth suicides. I brought her with me to Carleton once and she felt something very uncomfortable there that made her shiver. By November 24, 2003 I was shivering all the time. I couldn’t get warm even when I returned south every three weeks. She brought me country food, and sewed special slippers and mittens without thumbs so I could get warm at night. I still cannot remember the chronology of even the most important events that occurred after I returned from the Pangnirtung cemetery in June 2002? I remember spending hours on this layered image using a very old version of Photoshop that came for free with a scanner? My screen was of such poor quality I couldn’t really see what I was doing. I had taken a series of photos while canoeing on Bell Lake. There was one series in particular that I am fond of. The light that day illuminated a small forest of algae below us as we paddled silently just skimming the surface in our 1930s cedar canoe. The light played with ripples that mirrored the deep greens of the Gatineau in the summer. I tried to be philosophical about what was happening . . . Glass half empty, half full. 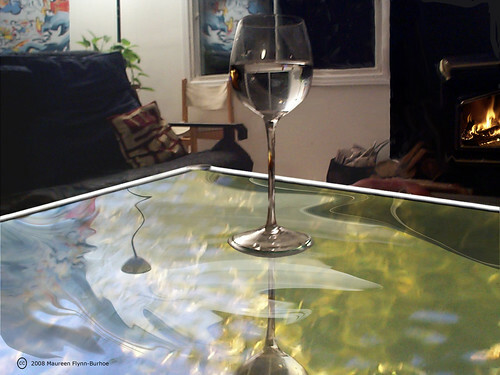 I played with reflections from every angle. Reflexivity the metaphor inverted, rotated, fire, water, snow. I had painted Angels of Fire and Snow first as a sketch and then as a large acrylic canvas in the 1980s in Pointe-Noire, Congo but we left it behind along with most of our belongings. When we returned to Canada I painted it again. It took me at least two months to complete it. Behold the candle as it shares its light, weeps away its life drop by drop. Were it not for the fire, you would drown in your tears. Joany Lincoln and her family lived a number of years in French-speaking Africa, Bangui, Central African Republic where we met them. She’s also traveled to the Democratic Republic of the Congo, Congo-Kinshasa (formerly Zaire). Bell, Jim. 2003. “Tragedy takes toll among youth with suicides at an all-time high: Nunatsiaq News. November 7. Depalma, Anthony. 1999. “In New Land Of Eskimos, A New Chief Offers Hope.” New York Times. April 4. Health Canada’s First Nations & Inuit Health Branch, in partnership with Assembly of First Nations and Inuit Tapiriit Kanatami/National Inuit Youth Council published The National Aboriginal Youth Suicide Prevention Strategy in 2006. A substantial body of literature on epidemiological studies estimate that between 36 and 81 percent of the general population experience a traumatic event at some time in their lives which is far more often than previously believed (Cusack et al. 2004). A US study a team of researchers led by Karen J. Cusack, Ph.D. concluded that since Post Traumatic Stress Disorder (PTSD) is associated with some of the most serious psychosocial impairments and highest rates of mental health service use and costs than any other disorder, it is important to identify an individual’s lifetime trauma exposure history. Yet in publicly funded health services screening for and therefore treatment of trauma exposure is rare (Cusack et al. 2004). Cusack’s team promoted an educational component directed at intake workers which included several reliable instruments for measuring trauma symptoms based on DSM-IV including a self-report PTSD Checklist. Post Traumatic Stress Disorder (PTSD) occurs when one is traumatized directly (in harm’s way) (DSM IV APA, 1994 ). However parents, professional health care workers, teachers and others may be traumatized indirectly. Secondary Traumatic Stress, Vicarious Trauma, Compassion Fatigue are experienceed though different social pathways. According to Charles R. Figley, Ph.D. of the Florida State University Traumatology Institute, there are few reports of the incidence and prevalence of Secondary Traumatic Stress. He suggests that related concepts such as Burnout, countertransference and worker dissatisfaction may have masked this common problem (Figley 1995). See Figley (2004). Vicarious traumatization, for example, refers to a transformation in the therapist’s (or other trauma worker’s) inner experience resulting from empathic engagement with clients’ trauma material. . .[and] vulnerable to the emotional and spiritual effects of vicarious traumatization. These effects are cumulative and permanent, and evident in both a therapist’s professional and personal life (Pearlman & Saakvitne, 1995, p. 151). According to Figley (1997) Compassion Fatigue or Secondary Traumatic Stress Disorder, is nearly identical to PSTD, except it affects those emotionally affected by the trauma of another. “The terms “compassion fatigue” (Figley,1995) and “secondary traumatic stress” (Figley, 1995; Stamm, 1999) have been used interchangeably to denote a syndrome of symptoms nearly identical to Post-Traumatic Stress Disorder except that exposure to a traumatizing event experienced by one person becomes a traumatizing event for the second person (Stamm, 1999). Finally, the majority of studies in this area have used the term vicarious trauma which has been defined as “the transformation that occurs in the inner experience of the therapist that comes about as a result of empathic engagements with clients’ trauma material” (Pearlman & Saakvitne, 1995, p.31). 1. DSM IV (APA, 1994) is the American Psychiatric Association’s diagnostic disorders manual which is updated every ten years. Aflicktion  is not really real. It exists in a liminal space between real events and people and entirely fictional accounts and imaginary characters. Flicktion is a term developed by Web 2.0 innovater, artist and author Andrew L for his Flickr-based nonlinear story entitled Doorbells of Florence. I could not connect with this group and after awhile I realized I didn’t even want to. I thought X had a kindly, compassionate expression on his/her face. I was disconcerted by his/her questions on the First Nations Treaty issues: […] Was I wrong or was X uninformed of the First Nations and Inuit relationship of decades long negotiations of treaties that were not respected and demanded constant re visiting? My heart sank when I realised the mind, heart and spirit behind the promising smile were without interest to me. I guessed that X spent very little time trying to understand the First Nations and Inuit point of view. X returned to the workforce after retirement to take up lucrative contracts with the Nunavut government? The combined package of salaries and benefits seems obscenely high here. X’s rates as a consultant are even higher. How frightening that X plays a pivotal role in a decision making team here. Behind the congenial face, is the face of the bureaucracy here that keeps the status quo in place. As I write I am torn and I feel physically affected by the awful truth. Iqaluit is filled with X’s. No wonder the money continues to enrich bureaucrats leaving the Inuit population here without substantial services and in over crowded conditions that are more like third world than a developed country. I knew this. I knew there was skimming. Please let me be wrong. [I am hoping that my…] my own inadequacies have led me to misjudge. I need to remember that once a light has come on, and the picture of inequalities is clearly visible, I too have some small role to play in it. I can contribute to maintaining the social injustice or I can work towards greater social equalities. I have a strong feeling that I am more effective in the background until my degree is completed. I am more useful right now in helping those in the foreground perform their work more effectively. I just have to trust that slowly I will be led to like minded people. Prevent me from wasting any energy on judging others. [They] began to compare employee benefits between the Nunavut government and the federal government. Y works for Customs and Immigration as a Custom’s officer. Y inquired about working for a summer term here. (Y’s father worked here last year.) Y was offered a two year contract. The federal government was not interested in hiring anyone for a short term contract. Y’s employment package would include: an apartment, a car, 2 trips south a year with 6 weeks vacation each?, 2 trips south for business, a salary of upwards of 70,000 plus northern benefits. The total package sounds like it would be $120, 000 for a Custom’s officer in a town of 7000 people with an airport that does not have international flights. Y’swork would be fairly abstract to say the least! I have heard people snickering about the limited enrollment of Nursing and Law students here in Iqaluit and the cost of these programs. Few people snicker at these obscene government employees packages that drive up prices in Iqaluit and exaggerate the have and have not divide. Sons and daughters of these employees reap the added benefits of well paid, prestigious summer jobs. I have been trying to understand the phenomenon of so many Government people working on weekends and evenings. Z explained that it is considered to be a part of many jobs. Work is scheduled with an assumption that people will be willing to work overtime on weekends. These government workers have three month vacations! They are encouraged to travel on business trips often. No wonder they have to work overtime to catch up! The language they use is closed jargon. Even the location of their offices is very confusing. They refer to their buildings by number not by name. Z noted that for the last budget he recommended that the government not instate the use of vouchers to replace cheques for welfare. Z’s suggestions were not listened to. This is one of the Nunavut government’s … advisors????? Flynn-Burhoe, Maureen. 2007. “Nanuq of the North II: Animal Rights vs Human Rights.” Speechless. Uploaded January 3, 2007. The Bush administration took advantage of the way in which all eyes turn towards Santa’s North Pole, where big-eyed talking polar bears, reindeer and seals live in harmony, to announce that they would save these creatures from Nanook of the North. See story. For a divergent point of view read Nunatsiak News article. On August 13, 1942 in Walt Disney studios’ canonical animated film Bambi it was revealed that many animals with cute eyes could actually talk and therefore shared human values. Nanook and his kind became the arch enemy of three generations of urban North Americans and Europeans. Hunters were bad. Cute-eyed animals that could talk were good. Today many animals’ lives have been saved from these allegedly cruel hunters by the billion dollar cute-eyed-talking-animals-industry. The White House has once again come to the rescue of these vulnerable at-risk animals. (There was an entire West Wing episode in which a gift of moose meat was rejected by all staff since it came from a big-eyed-talking-animal. See Ejesiak and Flynn-Burhoe (2005) for more on how the urban debates pitting animal rights against human rights impacted on the Inuit.) Who would ever have suspected that the Bush administration cared so much about the environment that they would urge an end to the polar bear hunt, already a rare phenomenon to many Inuit since their own quotas protected them? When I lived in the north the danger for polar bears did not reside in the hearts of hunters. Nanuq the polar bear who could not talk was starving. He hung out around hamlets like Churchill, Baker Lake or Iqaluit, looking for garbage since this natural habitat was unpredicatable as the climate changed. Some people even insisted that there was no danger from the polar bear who had wandered into town since he was ’skinny.’ That did not reassure me! I would have preferred to know that he was fat, fluffly and well-fed. Polar bears die from exhaustion trying to swim along their regular hunting routes as ice floes they used to be able to depend on melted into thin air literally. They die, not because there are not enough seals but because they need platform ice in the right seasons. That platform ice is disappearing. They die with ugly massive tumours in them developed from eating char, seals and other Arctic prey whose bodies are riddled with southern toxins that have invaded the pristine, vulnerable northern ecosystem. Nanuq is dying a slow painful death. Nanuq is drowning. Although he doesn’t sing he is a canary for us all. Climate change and southern industrial toxins affect the fragile ecosystem of the Arctic first. The Inuit claimed in 2003,”Global warming is killing us too, say Inuit .”This is why Sheila Watt-Cloutier laid a law suit against the administration of the United States of America. Now the handful of Job-like Inuit who managed to survive the seal hunt fiasco of the 1980s and are still able hunt polar bear, will have yet another barrier put between them and the ecosystem they managed and protected for millennia. When I see Baroque art and read of the Enlightenment, I think Hudson’s Bay and the whalers in the north. It wasn’t the Inuit who caused the mighty leviathan to become endangered. Just how enlightened are we, the great grandchildren of the settlers today? Who is taking care of our Other grandparents? Since the first wave of Inuit activists flooded the Canadian research landscape fueled by their frustrations with academic Fawlty Towers they morphed intergenerational keen observation of details, habits of memory, oral traditions and determination with astute use of artefacts and archives to produce focused and forceful research. When Sheila Watt-Cloutier representing the Inuit Circumpolar Conference (ICC) was acknowledged with two awards in one year for work done to protect the environment, I wondered how many cheered her on. I don’t cheer so much anymore. I am too overwhelmed, too hopeless to speak. I myself feel toxic, perhaps another pollutant from the south — my name is despair. I don’t want to dampen the enthusiasm of those activists who still have courage to continue. For myself, I feel like the last light of the whale-oil-lit kudlik is Flicktering and there is a blizzard outside. In 2002, Watt-Cloutier was elected International Chair of ICC, a position she would hold until 2006. 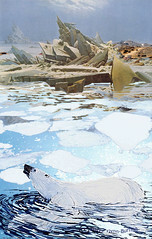 Most recently, her work has emphasized the human face of the impacts of global climate change in the Arctic. In addition to maintaining an active speaking and media outreach schedule, she has launched the world’s first international legal action on climate change. 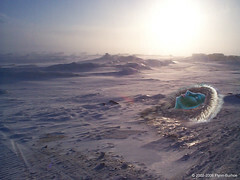 On December 7, 2005, based on the findings of the Arctic Climate Impact Assessment, which projects that Inuit hunting culture may not survive the loss of sea ice and other changes projected over the coming decades, she filed a petition, along with 62 Inuit Hunters and Elders from communities across Canada and Alaska, to the Inter-American Commission on Human Rights, alleging that unchecked emissions of greenhouse gases from the United States have violated Inuit cultural and environmental human rights as guaranteed by the 1948 American Declaration of the Rights and Duties of Man. Gertz, Emily. 2005. The Snow Must Go On. Inuit fight climate change with human-rights claim against U.S. Grist: Environmental News and Commentary. 26 Jul 2005. DEW line contaminated sites in Nunavut. This will be updated from EndNote. If you require a specific reference please leave a comment on this page. Creative Commons Canadian Copyright 2.5 BY-NC-SA.